Can a business possess a social mission? Can it pursue the twin goals of earning a profit while providing solutions to a social problem at the same time? Countless examples of successful social enterprises around the world have shown that the answer to both questions is a resounding Yes. On March 17, 2012, a conference entitled, "EntrepreneurShift - How Social Enterprise Is Changing The World" will feature a new generation of Filipino entrepreneurs who have proven that a business can be financially successful while helping alleviating poverty at the same time. It will be held at SM Cinema 6 of SM City Iloilo at 10:00AM. La Residencia is one of Iloilo’s best high end residential estates that is only for the elite and affluent homebuyers. It is a project of IVQ Landholdings, Inc. It is located at the heart of Villa Arevalo District, and just a few meters away from the Arevalo Public Market and various business establishments like the famous Tatoy’s Restaurant, Breakthrough Restaurant, the Arevalo Roman Catholic Church (third oldest church in the Philippines) and the Arevalo Police Station. It stands in a major city road where private and public vehicles ply 24 hours a day. It is just 15 minutes away from the city proper. Many people are still nervous of getting into real estate investing. There are various reasons for this. It seems to require a lot of technical knowledge; it can involve high financial costs; and it appears to involve a lot of hard work. These things are, of course, true. However, there are countless reasons why one should invest in real estate when there are other avenues for investing. The main reason people to choose the real estate market is that, real estate is very much profitable and safer when compared to other kinds of investing like mutual funds, currency investing and buying silver or gold. You should have noticed one major thing in real estate investing, even though there are some ups and downs; the real estate is always growing. The first and one of the easiest ways to make money is from the cash flow from rental properties. This means the difference between your income and your expenses on that specific piece of property. Of course, this can be either negative or positive. You feel a lot better when it's positive, but negative cash flow isn't necessarily bad if it's a planned part of your investment program. But be careful of the temptation to use up your whole cash flow on rapid debt reduction. The city of Iloilo in the Philippines boast what is being called the islands first world-class mass housing community outside of Manila. It is called Providence Iloilo. The residential plaza in Iloilo was designed by Ildefonso Santos, ASLA, considered the “Father of Philippine Landscaped Architecture. Providence Iloilo is a new urban community model for the islands, designed to have a balance of housing, jobs and services. Santos’ structure at the entrance to the new community includes an egg-shaped work of art and a dancing fountain with synchronized lightings and music, said to be the first mechanized fountain on the island of Panay. A reflecting pool incorporates 70 some sculptured brass birds in flight and ara-al boulders. The environ around the pool combines greenery, pavestones and two walls of colorful mosaic tiles. Just like new home construction, home improvement or remodeling and renovation requires planning and expertise. The plan should begin with a structural map or detailed drawings. It is here that you can note down changes that you need to make. The renovation or remodeling is best done by general contractor expert at the job. The exercise is usually taken to adjust lifestyle changes, repair and maintenance. The effort in turn ends up increasing the market value of your real estate property. We can find your dream home! We have worked with a wide network of real estate brokers, agents, marketers and developers in the Panay Island area and other cities and provinces in the Philippines. As experts in the Panay Island real estate industry, we keep track of every real estate development in the area from residential subdivision and condominium projects to commercial real estate projects. We have also updated listings of almost every home for sale from individual homeowners. Visit or contact us today for a schedule of a FREE CONSULTATION and NO COMMITMENT site and property tripping! You may also take with you your loved ones for the tripping since we have a brand new 10-seater van to take you all there! Are you a real estate property owner or a developer? Are you a real estate property owner or a developer who want help in marketing and selling your property? We can help you market and sell your property or projects! We have worked with a wide network of real estate brokers, agents and marketers in the Panay Island area and other cities and provinces in the Philippines. We will aggressively market your real estate property or projects not just locally, but on a national and international basis especially for our Overseas Filipino Workers (OFWs). Through our professional contacts and affiliations, as well as our advanced online marketing technology tools, we can instantly put your project listings in all of the places qualified buyers are looking. We can instantly alert our wide network of real estate brokers, agents and marketers in the area. We can help you realize your goals of high returns on investments by providing you straightforward information and guidance every step of the process. As a natural instance, when the population of an area increases, the total usable land decreases, and this provides the impetus for high real estate prices. Remember housing is the necessity of an individual and therefore it is much in demand than any other single commodity taken. Furthermore, there are people who purchase additional houses for their recreation, recluse or as a past time. This in turn increases the demand for real estate properties. The Uptown Place is a 4-storey mixed residential condominium and retail commercial strip project of Injap Land Corporation. It is located at General Luna Street right in front of the grand Sarabia Manor Hotel and Convention Center. It has a total of 177 semi-furnished units outfitted with balcony that affords a great panoramic view of the Iloilo River. It will be equipped with 2 service elevators and full capacity generator sets. The location of the project provides great accessibility to schools, hospitals, and shopping malls. The ground floor will be open for lease for interested commercial establishments. 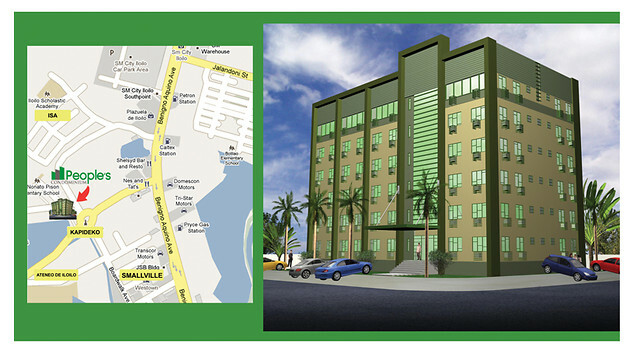 Injap Tower Condotel is a 21-storey commercial and residential tower project of Injap Land Corporation to be built in a 1,046 square meter newly acquired property at the corner of Jalandoni Street and Diversion Road, right across SM City Iloilo in Mandurriao district. It will have commercial units in the ground floor, multi-level parking and residential condominium units. The high-rise building is designed by the famous ASYA Design firm headed by its principal Architect, Albert Siy Yu. The project is slated to put not only Iloilo City but the whole island of Panay in the map of the Philippines as the next investment hub. People’s Condominium San Rafael is one of Injap Land Corporation's prime real estate projects in Iloilo and is the first vertical condominium property in the city. It's a six-storey condominium with 71 semi-furnished studio, one bedroom, two bedrooms and three bedrooms units at the KAPIDECO estate in Barangay San Rafael, Mandurriao, Iloilo City. It's located at the corner of Pison Rotunda near Ateneo de Iloilo new site, SM City Iloilo and Smallville Complex. The KAPIDECO estate is a prime mixed use commercial and residential complex and is eyed as part of Iloilo City’s area of future growth. With all of these, tenants of the People’s Condominium will enjoy living in close proximity to Iloilo City’s zone of vibrant and sprawling development. Olive is a house model of Parc Regency Residences, a subdivision project of PRO-FRIENDS or Property Company of Friends, Inc. located in Ungka 2, Pavia, Iloilo. It is a two-storey, 80 square meter single-attached house on 120 square meter lot area. It has four bedrooms, two toilets and baths, a living room, dining area, kitchen, provisions for a lanai, balcony and one-car garage. Lotus is a house model of Parc Regency Residences, a subdivision project of PRO-FRIENDS or Property Company of Friends, Inc. located in Ungka 2, Pavia, Iloilo. It is a 40 square meter single-attached house on 100 square meter lot area. It has two bedrooms, one toilet and bath, a living room, dining area, kitchen, provisions for a lanai, carport and one-car garage. Daphne is a house model of Parc Regency Residences, a subdivision project of PRO-FRIENDS or Property Company of Friends, Inc. located in Ungka 2, Pavia, Iloilo. It is a two-storey single-attached, 52 square meter house on 100 square meter lot area. It has three bedrooms, two toilets and baths, a living room, dining area, kitchen, laundry/service area, provisions for a lanai, balcony and one-car garage. Isabella is a model house of Monticello Villas, a subdivision project of PRO-FRIENDS or Property Company of Friends, Inc. located in Barangay Balabag, Pavia in Iloilo. It is a two-storey, 40 square meter townhouse on 45 square meter lot area. It has three bedrooms with partitions, one toilet and bath, a living room, dining area, kitchen, laundry/service area, provisions for a one-car garage. Florence is a model house of Monticello Villas, a subdivision project of PRO-FRIENDS or Property Company of Friends, Inc. located in Barangay Balabag, Pavia in Iloilo. It is a two-storey, 46.56 square meter, single-attached house on a 66 square meter lot area. It has two bedrooms, one toilet and bath, a living room, dining area, kitchen, laundry/service area and provisions for one-car garage. Parc Regency Residences is a 49.5-hectare subdivision project of Pro-Friends or Property of Company Friends, Inc. located in Ungka 2, Pavia, Iloilo, only 10 minutes from the Iloilo International Airport. Parc Regency Residences prides itself in being the first and only subdivision in Iloilo with a linear park – the extra open space provided for recreational use to be enjoyed by the residents within the same block. It is an ideal place for neighborhood gatherings, picnics and other outdoor activities. Find comfort in being able to take leisurely walks amidst verdant surroundings in a secure environment. Property Company of Friends, Inc., also known as PRO-FRIENDS, is one of the fastest growing property developers in the Philippines. In a span of 12 years, they have finished and delivered 52 projects. This year, they have 36 on-going horizontal projects. They have grown from being a provider of homes in small pocket developments, to medium rise condominiums and townhouses, as well as single detached units in estate developments for the higher end market. It is a 49.5-hectare development located in Ungka 2, Pavia, Iloilo, only 10 minutes from the Iloilo International Airport. Parc Regency Residences prides itself in being the first and only subdivision in Iloilo with a linear park – the extra open space provided for recreational use to be enjoyed by the residents within the same block. It is an ideal place for neighborhood gatherings, picnics and other outdoor activities. It is one of the company’s prime real estate projects in Iloilo and is the first vertical condominium property in the city. It's a six-storey condominium with 71 semi-furnished studio, one bedroom, two bedrooms and three bedrooms units at the KAPIDECO estate in Brgy. San Rafael, Mandurriao, Iloilo City. It's located at the corner of Pison Rotunda near Ateneo de Iloilo new site, SM City Iloilo and Smallville Complex. To view more photos of perspective, floor plans and interiors of People's Condominium San Rafael, visit People's Condominium San Rafael's profile. In a span of 12 years, we have finished and delivered 52 projects. This year, we have 36 on-going horizontal projects. We have grown from being a provider of homes in small pocket developments, to medium rise condominiums and townhouses, as well as single detached units in estate developments for the higher end market.